Amid pressure over corruption scandal, Turkey's prime minister threatens to take Internet censorship even further. Turkey's embattled prime minister warned on Thursday that his government could ban websites such as YouTube and Facebook after a raft of online leaks added momentum to a spiraling corruption scandal, reported AFP. "There are new steps we will take in that sphere after March 30... including a ban (on YouTube, Facebook)," Prime Minister Recep Tayyip Erdogan was quoted as having told private ATV television in an interview. Erdogan's ruling Justice and Development Party (AKP) has come under mounting pressure since last week, when audio recordings were leaked in which Erdogan and his son allegedly discuss how to hide vast sums of money. The Turkish premier dismissed them as a "vile" and "immoral" montage by rivals ahead of key local elections on March 30. A series of other online leaks showed Erdogan meddling in trade deals and court cases. Erdogan's government has been shaken by a high-level corruption scandal that erupted in mid-December and ensnared the premier's key political and business allies. Erdogan has accused loyalists of ally-turned-opponent Fethullah Gulen, an influential Muslim cleric based in the United States, of orchestrating the graft probe. In response to the scandal, the Turkish government has moved to increase censorship of the Internet. A recently passed bill stipulates that Turkey’s Telecommunications Communications Presidency (TIB) can demand that Internet providers block pages deemed insulting or considered an invasion of privacy. Riots broke out last month in Istanbul's Taksim Square over the new censorship laws, but Turkey's president Abdullah Gul nevertheless signed the law into force. 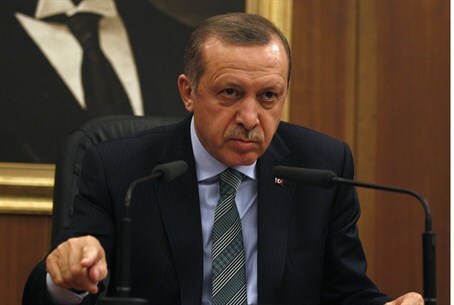 In June of 2013, Erdogan accused social media of being responsible for the Gezi Park protests.